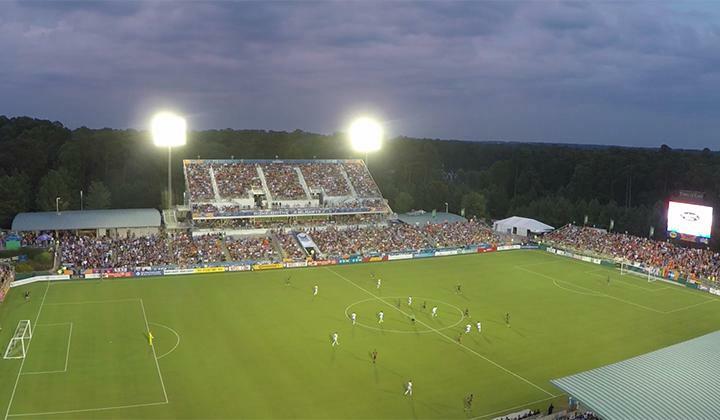 WakeMed Soccer Park is one of the premier soccer complexes in the United States and is the home of North Carolina FC and 2018 NWSL Champions NC Courage. It opened in 2002 as the home of the Women's United Soccer Association's Carolina Courage. The soccer complex consists of a purpose-built, soccer-specific main stadium, two lighted practice fields built to the same specifications as the stadium field, and four additional practivefields. The main stadium seats 10,000 people. Fields 1 (main stadium), 2, and 3 are all FIFA international regulation size (120 yards x 75 yards). WakeMed Soccer Park opened in May 2002 as State Capital Soccer Park. It sits on 150 acres on the eastern edge of Cary that the State of North Carolina has leased to Wake County. Money to build the soccer park came from $14.5 million in county-wide hotel room and prepared food and beverage taxes. The Town of Cary assumed responsibility for operations and maintenance in 2004 from the Capital Area Soccer League. On January 1, 2008, WakeMed Health & Hospitals, a private, not-for-profit health care organization based in Raleigh, acquired the rights to name the park from the Town of Cary. SAS, a Cary-based software company, previously held the complex's naming rights. The complex also sports a full-length, nationally-recognized cross country course. In addition to serving as the home of North Carolina FC and the NCCourage, WakeMed Soccer Park has also been the host of men's and women's ACC soccer tournaments, men's and women's NCAA College Cups, as well as U.S. Men's and Women's national team friendlies. WakeMed Soccer Park is ½ mile on the right. WakeMed Soccer Park will be ½ mile on the right.